They say if you give a woman a fish, she�ll eat for a day. But if you teach her how to fish, she�ll eat for the rest of her life. We�ve all heard this before. But its lesser known friend is the fact that you teach most strongly not by what you say, but by how you live. Wouldn�t you agree? My daughter learns how to live�for better and worse�by watching her mother and me. So it is a little like ignoring the 400 lb. gorilla in the room, to write for you each week about strategies for doing things outside with your kid, but not addressing your own�. Outdoors-ness? It�s a little like teaching you the finer points of catching a fish before showing you how to cast out the line in the first place�or even how to tie on the hook. That�s why we�re going to talk about just that. The most powerful way to get your kids outdoors isn�t bikes or backpacks or tents or campfires or even�gasp!�s�mores. Those are all great things, but they�re tools and manifestations. That is to say, the urge to get outdoors can take many forms, and that urge will use all of the above. But where does the urge come from? Well, I could try to be philosophical here about what it is that we truly love about the outdoors. I spent a few years there trying to dig into the experience and understand it. But I basically learned to stop overthinking and just accept the relaxation that the outdoors was offering. That�s not where I want this to go anyway�sorry for taking the wrong path (strange, I seem to say that a lot in real life, too!). Your kids’ love of the outdoors comes from watching you enjoy the outdoors. It�s that simple and it is that full of meaning. Think about it. Do you think your kid will one day love to go out into the mud because you bought him some boots, or because of that one day he saw you come home from a mountain bike race covered head-to-toe in mud, smiling and laughing, and telling stories about the race? 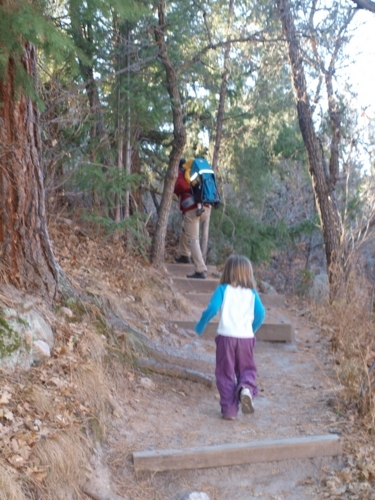 Will your daughter take walks in the woods someday because she read about Emily Dickinson doing it, or saw an REI ad? Maybe partly, but she�ll remember her walks with you much more strongly�if she remembers them at all! That�s the amazing thing, they will have become a part of her. So, it�s easy and it�s hard. It�s not about some kind of trick, really. It�s good to take your kids out on adventures, of course it is. But what it�s really about is your own love of getting outside. And therefore, it requires of you a sort of plan. And that plan can sometimes feel a little backward. See, what you want as a person who loves being outside is to go out and do whatever it is you like to do. For me, it�s go ride my mountain bike and kayak. But now you�re a parent, and if you�re lucky, you�re part of a two-parent team. And that team shares responsibilities. Like child-care, for instance. So when you get home from work, you may WANT to go take a ride. But there�s another part of you that says, �what I should do is stay home with the family.� And there�s nothing wrong with that�how could I say that? But part of that urge is good, and part of that urge is guilt or some other knot tied in your thinking. What I�m getting at is this. If you want your child to grow up loving the outdoors, that child needs to see you loving the outdoors. And sometimes that can take the form of walking with them in a baby backpack while your partner takes time for themselves. And that has its own special joy. But it�s not the same as hiking for yourself. You can take a ride with the toddler in the bike trailer. But it�s not the same as the toddler seeing you wheeling the bike out of the garage, and coming back sweaty, muddy, and happier. We need to convince ourselves, or remind ourselves, or whatever, that in order to teach our children to one day take care of themselves, we need to take care of ourselves too. I don�t mean health-wise, though that�s a subject worthy of its own post, but happiness-wise. If you want them to think there�s a magical transforming place out there, the best way to show them that is to go out and let it magically transform you. And a short postscript: Races can be great ways for them to see this. For them to see Mommy not jogging along like she does with the stroller, but really going for it lap after lap in the throes of actual adult competition. To see Daddy not in his �family man� guise like when they ride in the trailer, but with his race face on, sweat streaming off his face, riding FAST. Put that way, it almost makes you want to enter one, doesn�t it? Now, get out there. I�m giving you a free pass and a reason. Drop the guilt for an hour and get outside like you want to. And then let your partner do the same!